COME AND JOIN THE CRAZY, INSANE-ASYLUM FUN WE'RE HAVING!! haha! here is the rag that started it all. OK, Finally starting on the official list. You guys hurry up and tell me if you're doing it. It doesn't have to go in this particular order, I'll put you in where needed. Be sure to contact me and/or Scion before sending it off, we can't have it randomly jumping back and forth across the planet, it'd be a waste of time, and your money! When I first saw this in my washcloth drawer I screamed so loud i woke up the rest of my family, otherwise as far as I can tell its just a completely random bleach stain. 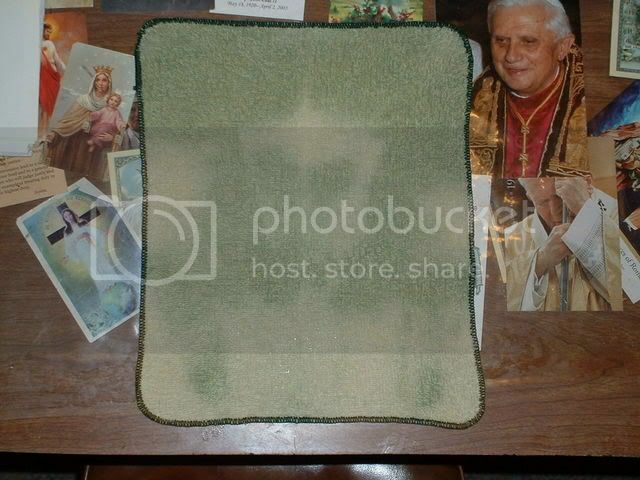 The Washcloth reminds me a lot of that grilled cheese Mary way back and kinda like that mildew Jesus that one guy found. Even though its just a randomly stained washcloth, it scares the crap out of me everytime I see it, most of the time I keep it locked up just incase it decides to try any funny business. I know its kinda hard to see this figure or satan, as I like to say, in the pictures I took. So I went and tried my best to outline it with good old MSpaint, yeah im really bad at it. I'm not totally sure what the things are on the sides of the washcloth, my personal opinion is that they are hands, maybe, not positive. I'll ship out the washcloth when I receive the payment. Shipping will be free. Have fun. Good Luck. Give me money." That's not satan, it's the skank hotel heiress! I wonder how much customs they charge to get a Satan Washcloth across to Canada. Oh come on. Everyone was thinking it but no one was saying it. How many would you like!? Wow, it's taking off. Up to a dollar forty five now! Someone from PSC just put a bid on it. Excellent, then we can get a higher quality image taken of it and use it for a source. what's next, Brittany Spears on toilet paper? We'll know for sure in a few days. funny you mention that. maybe I shouldn't have flushed that piece of toilet paper with that peculiar "pattern" on it after all!